Kinsale Energy previously operated, in the Southwest Kinsale reservoir, Ireland’s only gas storage facility and this facility ceased operation in April 2017. The Southwest Kinsale reservoir currently operates solely as a gas production reservoir in which the remaining cushion gas is produced (cushion gas is indigenous gas that provided the pressure support for the Southwest Kinsale storage service). The Southwest Kinsale Gas Field was discovered in 1995 and was brought on stream as a gas production reservoir in October 1999. 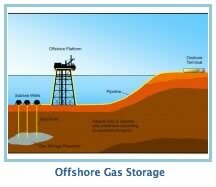 The gas reservoir is in the Upper Cretaceous sandstones covering an area of 1,200 hectares in size, 800 meters below the sea bed. The field was redeveloped in October 2001, whereby gas could be taken from nearby offshore gas fields and put into storage in the Southwest Kinsale reservoir. Subsequently, in 2006 modifications were made to enable gas taken from the onshore network to be stored in Southwest Kinsale. The storage capacity of the gas store was 230 million cubic meters (1 cubic meter of gas is equivalent to about 10 kW-hrs of energy).